Calling all sci-fi fans and those mad about all things Star Trek is the brilliantly created, thoroughly entertaining and intuitively interactive Star Trek online slot game at Mr Green. Based on the popular TV series and films, the Star Trek slot is a 5-reel, 30-payline slot developed by IGT; one of the most innovative games providers around. The graphics accompanying the game are extremely crisp and well designed using real pictures from the Star Trek movie to create the character symbols. Players are spoilt for choice with bonus games in Star Trek with no less than four bonus games each based on a Star Trek officer. The bonus game will differ depending on which round is triggered. Any of the bonus games can be triggered when two bonus symbols appear anywhere on the second or third reels accompanied by the appropriate Officer Bonus symbol (Kirk bonus symbol, Spock bonus symbol, Uhura bonus symbols or Scotty bonus symbol) anywhere on the fourth reel. From here the game is set in the transporter room where you beam up your Free Spin opportunity. 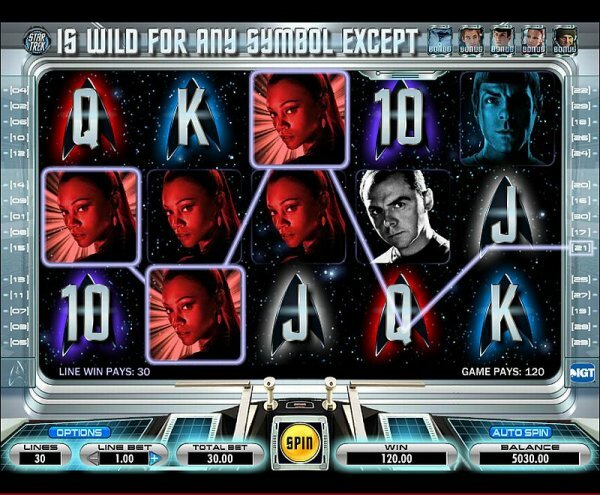 If you trigger Kirk’s bonus round you’ll get triple win multipliers, whereas the Spock bonus round has extra wild symbols which stay on the reels to give you more winning opportunities. In slight contrast the Scotty bonus round has increasing multiplier amounts as the free spins progress, and the Uhura bonus round gives you extra scatter payouts so that a huge reward may be in the offing. If you like slot machines like this, check out our fruit machines section. Any of the bonus games can be retriggered at any point throughout the game so you may just find that your winnings increase at warp speed! Whether you’re a true ‘Trekkie’ or someone just looking for a bit of futuristic fun, you’ll find that Star Trek is an excellent choice. You can play for fun or play for real at Paddy Power and claim a £150 sign up bonus.